As the importance of space reconnaissance technology intensifies, more and more countries are investing money in building their own space reconnaissance satellites. Due to the secrecy and sensitivity of the operations, it is hard to find published papers and journals on the topic outside of military and governmental agencies. This book aims to fill the gap by presenting the various applications and basic principles of a very modern technology. The space electronic reconnaissance system in mono/multi-satellite platforms is a critical feature which can be used for detection, localization, tracking or identification of the various kinds of signal sources from radar, communication or navigation systems. Localization technology in space electronic reconnaissance uses single or multiple satellite receivers which receive signals from radar, communication and navigation emitters in the ground, ocean and space to specify the location of emitter. 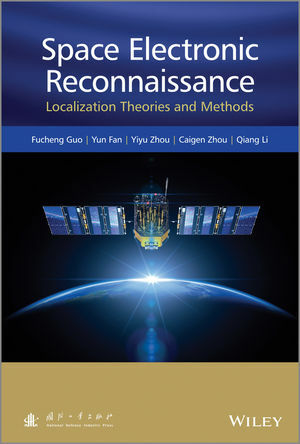 The methods, principles and technologies of different space electronic reconnaissance localization systems are introduced in this book, as are their performances, and the various methods are explained and analysed. Digital simulations illustrate the results. Highly relevant for Engineers working in avionics, radar, communication, navigation and electronic warfare. Chapters include:- the introduction of space electronic reconnaissance localization technology, knowledge about the satellite orbit and basic terminology of passive localization, single satellite geolocation technology based on direction finding, three-satellite geolocation technology based on time difference of arrival (TDOA), two-satellite geolocation technology based on TDOA and frequency difference of arrival (FDOA), the single satellite localization technology based on kinematics theory, localization principles of near-space platform electronic reconnaissance systems, the orbit determination of single satellite-to-satellite tracking using bearings only(BO) information, the orbit determination of single satellite-to-satellite tracking using bearings and frequency information, the orbit determination of single satellite-to-satellite tracking using frequency only(FO) information. Each chapter ends with a problem and solution section, some using Matlab code.